Posted March 7, 2014 by Sage & filed under Human Interest, Teaching, Yoga. The 10-year anniversary of the Carrboro Yoga Company—and hence of my teaching yoga—passed quietly on March 1, 2014, because I was busy teaching an intensive at the studio on classroom management and safety as part of our 500-hour yoga teacher training. The studio was founded by my friend and longtime Kripalu assistant Donia Robinson. When Donia moved to California in 2010, my partner Lies Sapp and I bought the studio from her. It has since expanded to include both 200- and 500-hour yoga teacher trainings, and a sister studio, the Durham Yoga Company. Donia brought me on as one of the original teachers, and I was teaching my 6 p.m. Monday Yoga for Athletes class from day 1—March 1, 2004. Without the time and space to explore this niche, my career would never have become what it is today. I’m so grateful to Donia for her vision and inclusion, to my students for their enthusiasm and teaching, to my colleagues for their diligence and inspiration, to Lies for sharing the work of shepherding the studio into bigger arenas to better serve the community, and to Wes, our kids, and our parents for supporting me all along the way. If you’re familiar with my YogaVibes videos, my DVD and its partner app, or even just the cover of The Runner’s Guide to Yoga, you’ll know Carrboro Yoga’s brick walls and original mill floors, its paper lanterns and gold circle. I love coming into the space not only as a teacher, but as a student, and I make a point of taking several classes each week. In the last ten years, I’ve traveled to teach across the continent. I’ve led classes of 3 students and classes of 300. I’ve taught the UNC basketball team on the floor of the Smith Center and the CEO of REI in a Seattle warehouse. 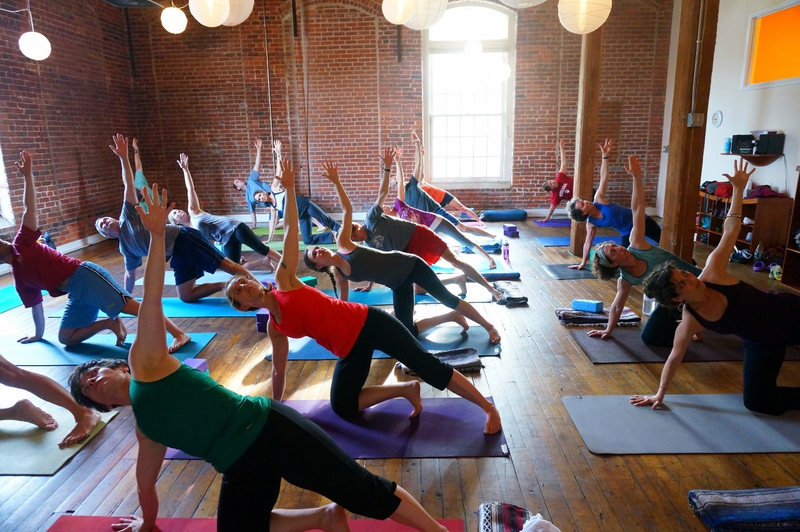 Throughout, Carrboro Yoga has been home—a space for community, for balance, for peace. I look forward to connecting with you there in the decade to come. Congratulations Sage on a decade as a teacher. Thanks for your guidance, insight and enthusiasm, and for developing and teaching the wonderful niche of yoga for athletes. I’m so glad I found you, and wish you all the best for the next ten years – and hopefully within that time we will one day meet.